When the ACA first passed it was expected that the per capita cost of covering its Medicaid expansion population (childless adults under the age of 65 up to 138% of the federal poverty line) would be substantially less than for the adults under 65 who were already on Medicaid. This seemed a perfectly sensible prediction. After all, the already-eligible population included individuals (such as pregnant women) with substantial known health care needs. 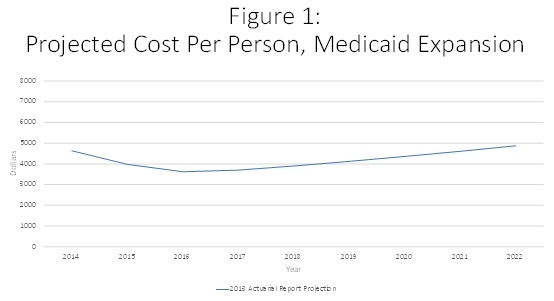 Accordingly, as seen in Figure 1, the 2013 Medicaid actuarial report projected that the cost of covering newly eligible adults would be $3,625 per person in 2016. This was substantially lower than the same report’s projection of 2016 per capita costs of $5,002 for covering previously eligible adults. These early projections, however, failed to anticipate the substantial cost growth that would arise from states under the ACA being able to pass 100 percent of expansion costs on to the federal government. 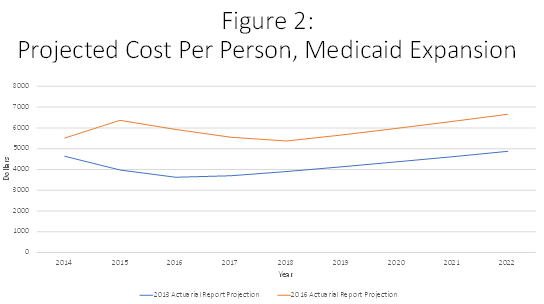 Figure 2 shows that in both 2015 and 2016 per-capita Medicaid expansion costs came in more than 60 percent higher than the earlier projections, as reflected in the 2016 actuarial report. But based on its recent score for the House’s American Health Care Act (AHCA), CMS appears to have abandoned these last glimmers of optimism about the costs of expansion. Per-capita expansion costs under the ACA are now projected to be more than 10 percent higher, through 2022, than expected even in the most recent actuarial report. See Figure 3. 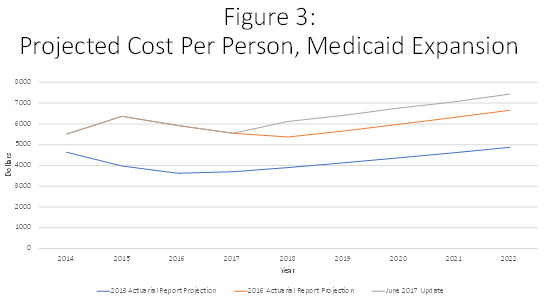 What this all means is that CMS now expects that through 2022, Medicaid expansion costs will be $7,436 per person, more than 50 percent higher than the $4,875 projected in the 2013 report. Thus, rather than just being an initial burst due to pent-up demand, this excess cost is now seen as a permanent feature of the ACA’s Medicaid expansion. The latest CMS projections show other concerning trends as well. From 2018 to 2026, per capita expenditures for covering the expansion population are now projected to grow more rapidly than they are for Medicaid’s more vulnerable historically eligible population of pregnant women, poor children, seniors and disabled. This rapid expansion expenditure growth would occur on top of the unexpectedly large costs in evidence to date. In other words, expansion has made Medicaid spending more poorly targeted. We’re already spending a far greater share than expected on Medicaid’s relatively less needy participants, and this poor targeting is expected to grow worse. Lawmakers are currently debating whether and how to modify the ACA’s substantial expansion of Medicaid. CMS’s latest projections show the per capita costs of that expansion rising still further beyond prior expectations. Charles Blahous, a contributor to E21, holds the J. Fish and Lillian F. Smith Chair at the Mercatus Center and is a visiting fellow at the Hoover Institution. He recently served as a public trustee for Social Security and Medicare.